Chobani, a domestic partner of Team USA, made the biggest gains in two out of three metrics that YouGov BrandIndex measured Olympic advertisers in the first 10 days of the tournament: Ad Awareness ("Which of the following brands have you seen an advertisement for in the past two weeks?") and Buzz ("If you've heard anything about the brand in the last two weeks, through advertising, news or word of mouth, was it positive or negative?"). Chobani’s rise coincides with its 10th anniversary, which they are marking with a 10-million product giveaway over a three-week period. The company, which owns the largest yogurt plant in the world, shipped 2,000 cases to Team USA, according to the company. 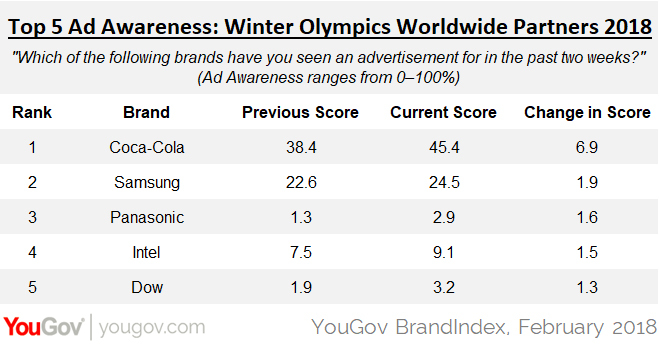 Among worldwide Olympic partners, Coca-Cola made the strongest showing over the first half, achieving high gains in Ad Awareness, Buzz, and Word Of Mouth ("Which of the following brands have you talked about with friends and family in the past two weeks, whether in person, online, or through social media"). A 90-year veteran of the Olympics, Coke paired up with four US competitors (including gold medalist Nathan Chen), and began their push as far back as September as the presenting partner of the Olympic Torch Relay. 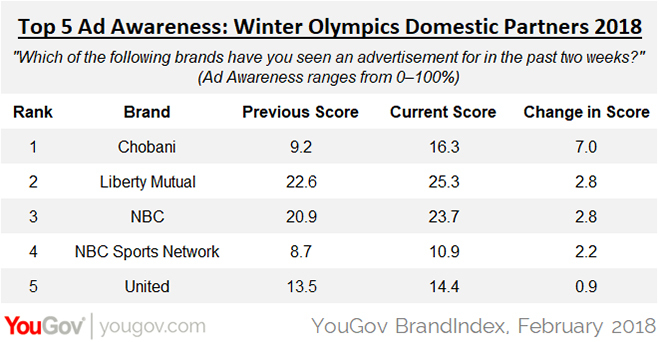 Olympic broadcaster NBC itself showed movement on YouGov BrandIndex’s tracking metrics as well, making the second highest gains behind Chobani in Buzz, and third highest in Ad Awareness. Their NBC Sports Network, which carries its own programming because of the large scope of Olympics sports coverage, earned the eighth-highest gains in Word of Mouth.